IN the 1960s, the BBC screened 253 episodes of its cult science fiction show Doctor Who, starring William Hartnell and then Patrick Troughton as the time travelling Doctor. Yet by 1975, the Corporation had wiped the master tapes of every single one of these episodes. Of the 124 Doctor Who episodes starring Jon Pertwee shown between 1970 and 1974, the BBC destroyed over half of the original transmission tapes within two years of their original broadcast. In the years that followed, the BBC, along with dedicated fans of the series, began the arduous task of trying to track down copies of as many missing Doctor Who episodes as possible. The search covered BBC sales vaults, foreign television stations, overseas archives, and numerous networks of private film collectors, until the tally of missing programmes was reduced to just 108 episodes. For the first time, this book looks in detail at how the episodes came to be missing in the first place, and examines how material subsequently came to be returned to the BBC. Along the way, those people involved in the recovery of lost slices of Doctor Who’s past tell their stories in candid detail, many for the very first time. Wiped! covers a somewhat contentious aspect of the BBC’s history, that of their wholescale throwing away of archive television recordings from the sixties, in a period leading to around 1977/8 when it was largely stopped by the intervention of concerned individuals. Richard Molesworth has painstakingly peeled back the layers behind these actions, finding out exactly what was destroyed and when, and then chronicling the attempts of fans to locate and replace the BBC’s lost archive of Doctor Who material – with a large degree of success. “I’ve always been fascinated by the subject of missing episodes: how they came to be missing in the first place, and how they got to be found,” explains Richard. “I remember reading about the ‘first’ publically announced recovered episode in Doctor Who Magazine – Part Two of ‘The Abominable Snowmen’ – and not being able to get my head around the concept of episodes of a BBC programme being in a private collectors hands. So I wanted to know more. “As I got to know more people in the BBC, and talk to people who had returned episodes, I realised that the stories behind the finds were fascinating. ‘I think fans – especially modern ones – just can not understand why the BBC don’t have every single one of the Doctor’s adventures sitting on the shelves of their archive. “Older fans, who were watching at the time of the original series in the late 70s or 80s, wanted to see the earlier Doctors probably more than they wanted to watch the new Doctor Who programmes that the BBC were making. “The older stories has such a mythos and mystique about them, and many of them had been novelised by Target books, which made you want to watch them even more, especially when photos from these stories began appearing in books and magazines much more at this point. “Those really, really older fans, who watched the series in the 60s, wanted to watch the stories they remembered with so much affection again. And of course, everyone loves a grail quest, and to Doctor Who fans, that’s what the missing episodes are. “If they had all been destroyed, and not a single episode had been found in the last 30 years, then I think fans would accept they’re gone, and move on. “But the fact that lost episodes did pop up from time to time (although finds have dried up in the last decade-or-so) gives them hope. And like all good grail stories, more myths, rumours and misinformation have cropped up around the subject of missing episodes than any other single aspect of the series. Richard has been researching the book for a good thirty years, so he had a wealth of information to draw on. “I’ve written articles for magazine like DWB and Doctor Who Magazine on the subject a fair few times. But after deciding to actually write the book – which I had been wanting to do for some years – I suppose it took about a year to pull everything together, to interview the people I wanted to talk to, and to write the text. TV historian and researcher Richard Bignell commented about Wiped! 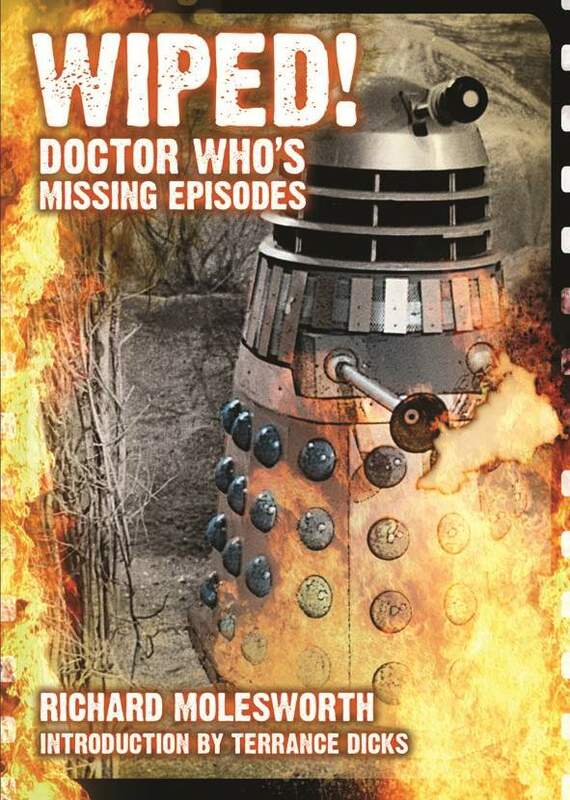 : “Richard’s dedicated research into the story of why so many episodes of Doctor Who came to be missing from the BBC Archive and how many of those episodes came to be recovered, is a fascinating journey of discovery.